“Were you born in a barn?” somebody may ask you if you forget to close the door. That may not be the origin of the phrase, but it is still being used because barn doors are often left wide open. Barn doors, though, do not necessarily go on the barn. Don’t forget to PIN this image for quick access to all these ideas! They are a type of door, usually made of wood or similar material, which would slide to the side to make it easier to store items. Maybe you don’t have a barn, but still use a closet, which is as close as modern urban homes come to owning one. After all, barns store stuff for a longer period, just as closets do. 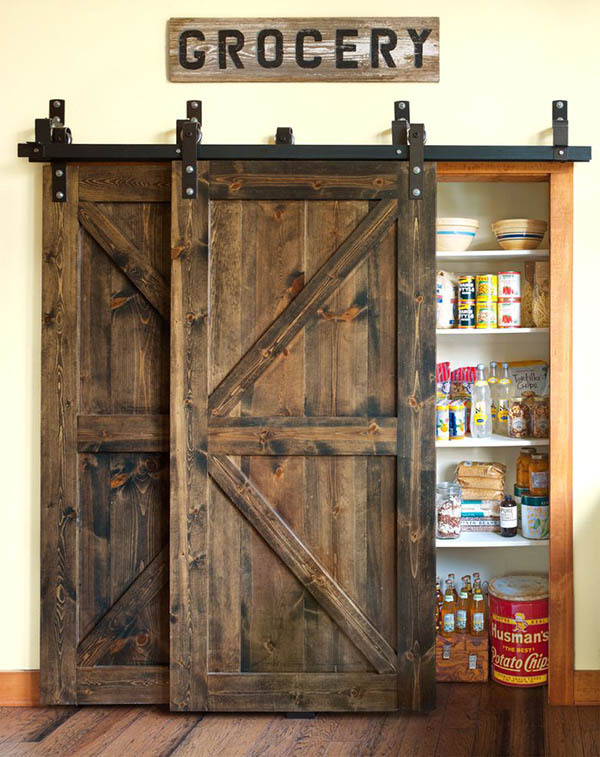 If you don’t have hay or animals whatsoever, a barn door can be still used to save space. As they slide to the side, they have no actual span, so you don’t have to keep a clear perimeter around them. Additionally, some find them great, because they bring a certain rugged aesthetic and country charm to the home. 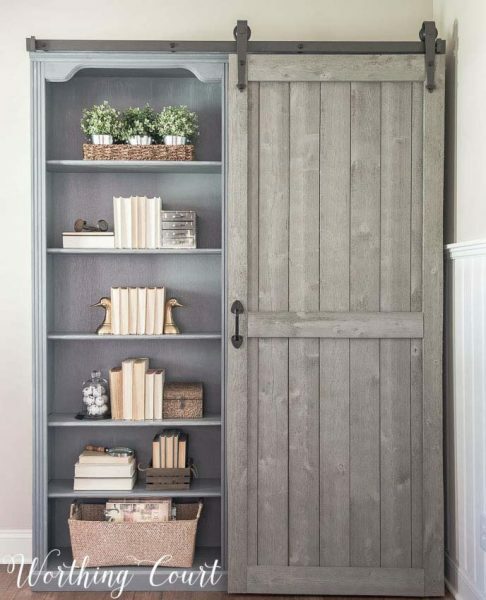 If you are a fan of farmhouse decoration, a barn door is a must! 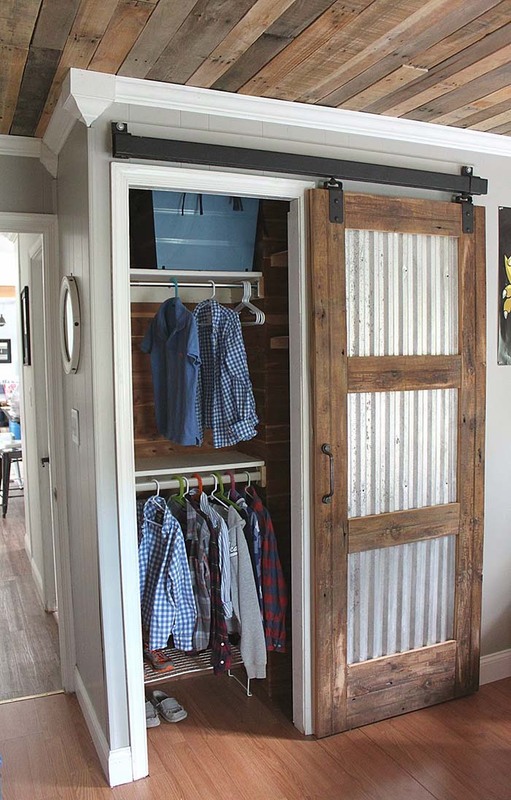 If you live in a tiny apartment or just want to use your space efficiently, barn doors are a great solution. Leaving them open won’t prevent you from moving around and you won’t have to clear up any obstacles for the doors to open. In this picture the barn doors even overlay, which makes it possible to open both just to one side. 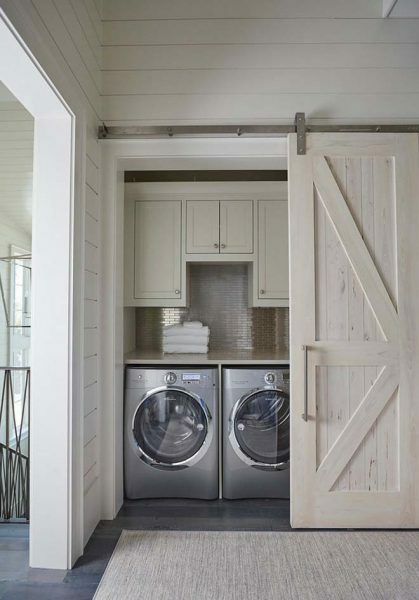 Of course, putting a swinging door to hide your washing machine would look kind of weird. That said, many people prefer not to show off their appliances. Here the barn door is used as a space divider: it opens to give access to a functional part of the room, without getting in the way. Once you are done with your washing, you close it and the house once again looks tidy and slick. Note how barn doors are used throughout this apartment, not only to seal the closet, but also for the bedroom next to it. 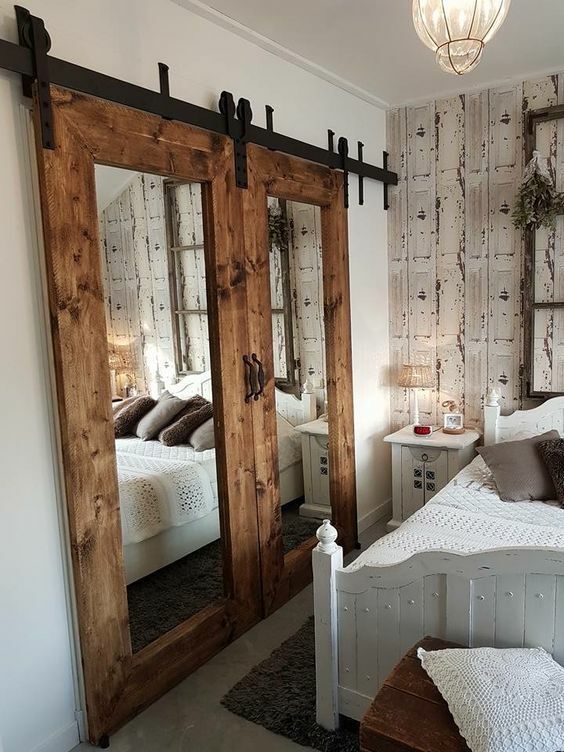 Apart from a space-saver, barn doors are also an interesting way to divide rooms and can be a solution entirely based on style. Barn doors are not a thing of the past. Still, if you want them to look vintage, they will be quite in their element. A rich worn wooden color emphasizes the use of nice natural materials. It will look like a blast from a past when people still made buildings by hand and it will let in coziness to your home. 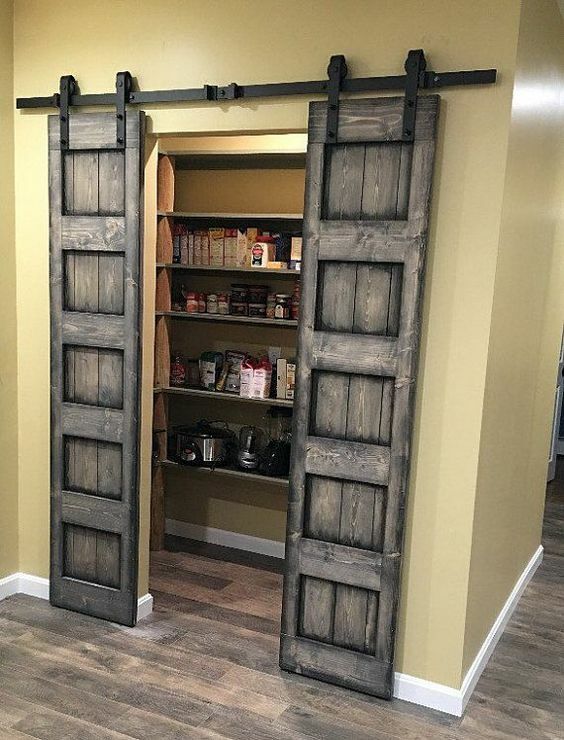 In case that wild west-style barn doors seem tacky to you, and you are the type of homeowner who prefers under- to overstating design, here is a good solution for you. 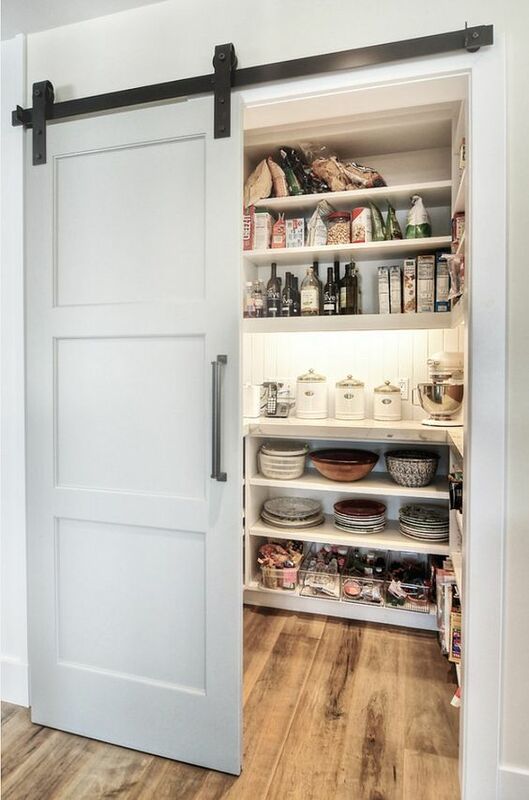 A simple barn door, which is not designed to stand out, but to match the interior and supplement neatness. 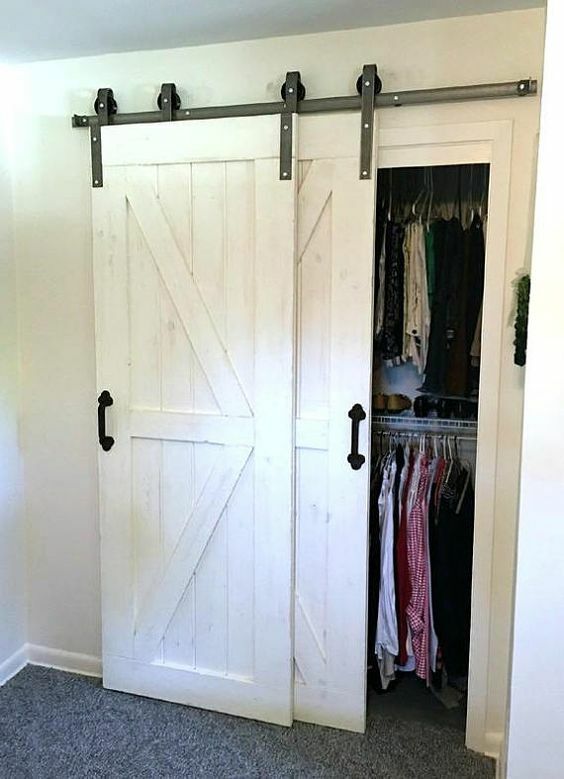 Closet barn doors are nowadays also installed in modern homes. 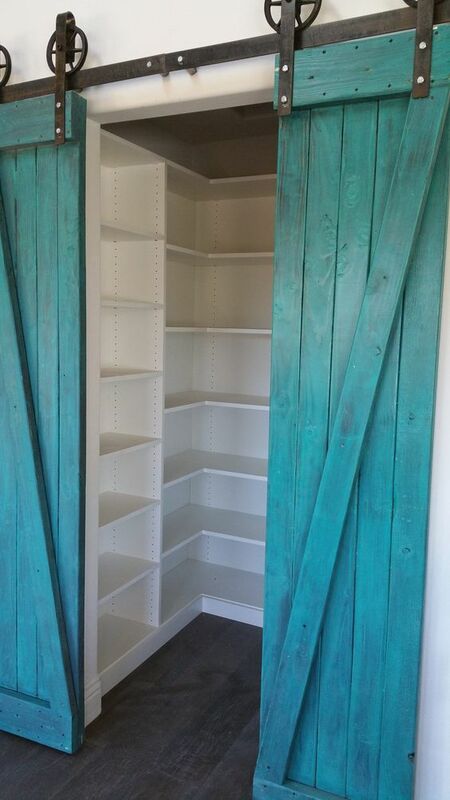 Even if you don’t like experimenting with colors, your closet barn door is still unique and stands out. The one shown here is a plain white, the same as the walls, but the distinguishable features of the door, such as the railing, make it interesting, nevertheless. If you don’t want to go for a slick black & white design, don’t worry! Barn doors are here to deliver. You can paint the sliding door in a bright vibrant color as an accent. The color can make a stronger impression if the door has a cool pattern, like this one. This dark colored closet barn door is a fantastic addition to any home. It adds a rustic cozy flavor, and that’s not even its most distinguishing feature: the door is made of two narrow cheeky panels, which open to both sides for some extra amazement once it show it to your guests. The owner of this house put in some extra effort to create an outstanding kitchen. 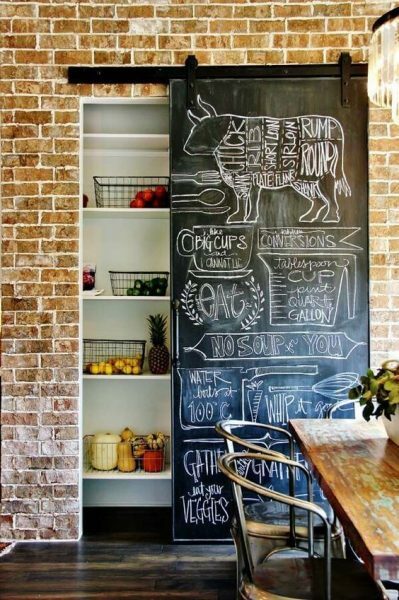 The barn door to the closet doubles as a chalkboard, where they can write down all kinds of notes, such as what they need from the market, recipes they want to try, or reminders for family members (such as ‘never skip breakfast’). 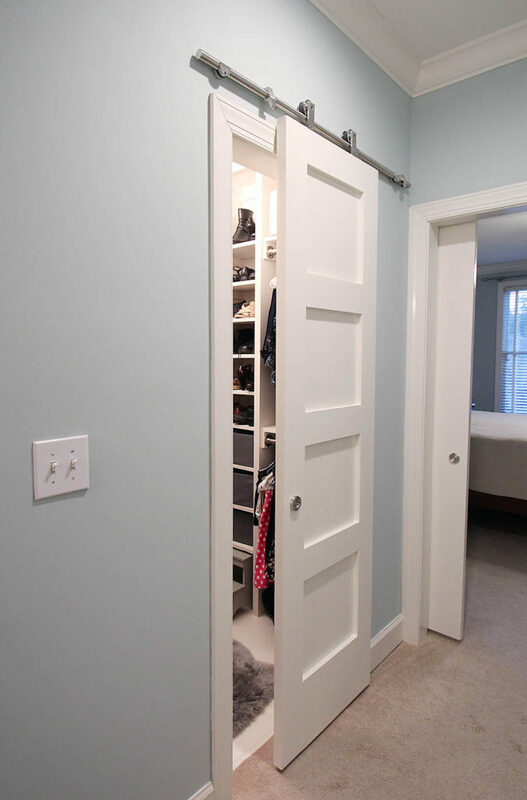 As mentioned above, barn doors for closets are really functional at saving space in a smaller room. The owner of this house wanted their home to look bigger as well, so they used a simple trick, which is well-known already: using mirrors to create an illusion, that the room is twice as spacious. It works well with this kind of door, because the huge rough frame combines neatly with the mirror. Barn doors are made of wood so they have some texture and natural color by default. That may not be enough for you, so you can always repaint, polish, paint some patterns or install a panel to make it look interesting. Forget the hinges, the most important element of a barn door is the railing. It has its own sliding or rolling mechanism, which you can install yourself, and which is certainly attention grabbing. The hardware you will need is anchors, spacers and bolts to install a mounting board. Then attach the track to it and make sure the railing is perfectly level. 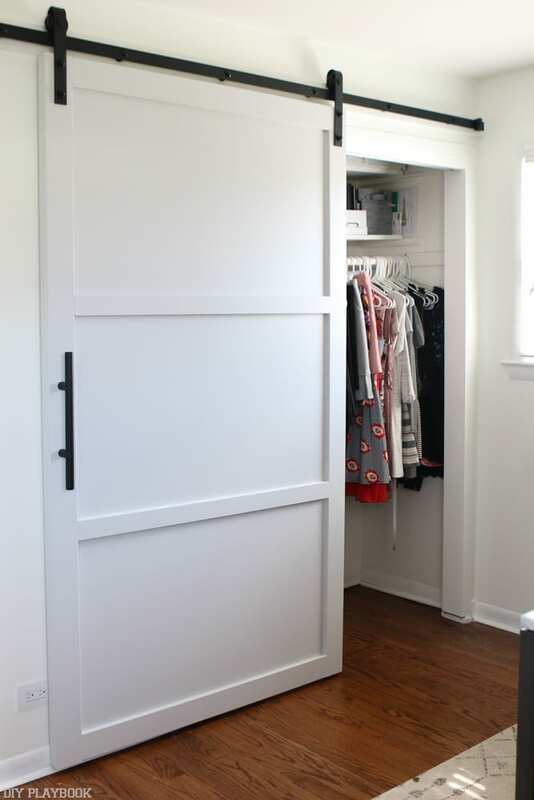 Once you have measured and assembled everything correctly, hang the door and voila, you have a barn door for your closet. Barn doors are a fine addition to a modern or rustic home, because they have a natural ability to stand out, without looking out of place. You can use them to add color or to keep a simple color palette, they save space and are convenient as a space divider. If you feel artistic, barn doors can be like canvas for your creativity.